Forests are natural resources that everyone should enjoy, which is why so many of South Africa’s timber plantations are open to the general public. Whether you’re an outdoor enthusiast wanting to test your endurance on the many mountain bike tracks, trail running routes or range of hiking trails, or more of a nature lover wanting to take in the array of wildlife and natural features found on forestry land we have somewhere new for you to explore! So what are you waiting for? 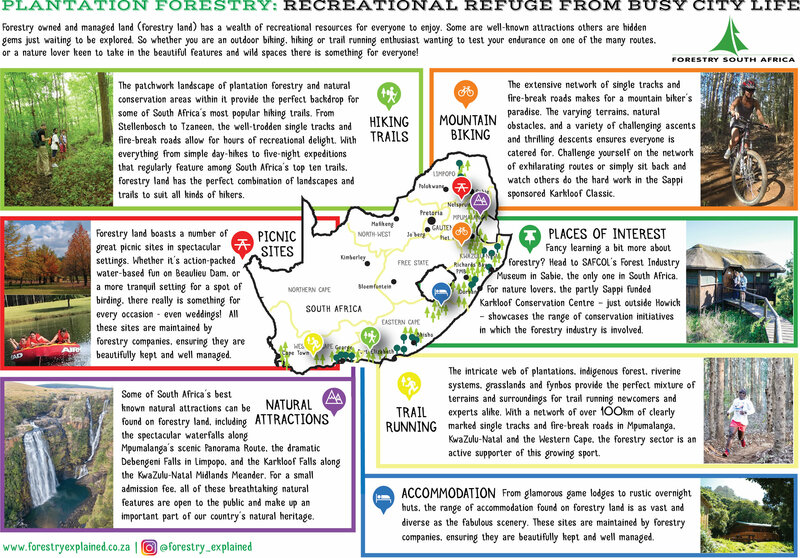 Click on the interactive map and check out the various attractions, trails, routes, drives, walks, picnic sites and accommodation found within South Africa’s forestry-owned land. DISCLAIMER – All information published on forestryexplained.co.za and in this summary serves as a guide only. While every effort has been made to ensure that the general information contained within the forestryexplained.co.za web site is accurate, we cannot be held responsible for the accuracy of information supplied by the individual establishments. All material supplied by these said establishments/activities is used by forestryexplained.co.za on the basis that they own the rights to the said material. Rates are subject to change without notice whether or not this is stipulated on any individual pages. The terms and conditions of each individual property/activity advertised on forestryexplained.co.za will be reflected in their own map pin. Forestryexplained.co.za nor Forestry South Africa will not be held responsible for any cancelled bookings or deposit returns.Forestryexplained.co.za , Forestry South Africa and its employees will not be held liable for any errors or omissions nor for any claims from any persons, for any reason whatsoever with regard to any establishment/activity published on the forestryexplained.co.za website.It is the responsibility of individuals browsing through the forestryexplained.co.za to satisfy themselves as to the accuracy of the information by way of enquiry and/or checking directly with the establishment/activity concerned.